A company that indexes journals — which, in turn, designates their impact factors — has delisted Oncotarget, a cancer journal that was recently removed from MEDLINE. Just three months ago, on October 18, the indexing company Clarivate Analytics (formerly part of Thomson Reuters) named Oncotarget a “rising star” in the field of molecular biology and genetics. 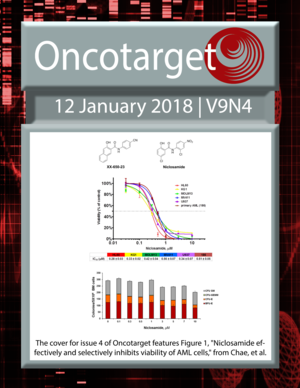 We remain perplexed by the abrupt decision to not include Oncotarget into the master list of the journals for 2018 without advanced notice and clear grounds. We are actively working to understand and rectify the situation. Many factors are taken into account when evaluating journals for coverage in Web of Science, ranging from the qualitative to the quantitative. We regularly review the journals to ensure they meet our stringent criteria. …the journal no longer meets the standards necessary for continued coverage. The spokesperson said it will continue to index all papers from Oncotarget published through the first few volumes of 2018. Essential Science Indicators by Clarivate Analytics provides citation rankings of scientists, institutions, countries, and journals broken out by broad fields of science. A citation threshold is applied to each field ranking; scientists and institutions are selected if they are in the top 1% by total citations in a given field, and countries and journals must be in the top 50%. The Essential Science Indicators is updated every two months, and the October 2017 blog post relates to a quantitative analysis only, of the data available on the scientists, institutions, countries, and journals that have the largest percentage increase in total citations from one update to the next. The full explanation of how this ESI quantitative metric is calculated is here. But, many factors are taken into account when evaluating journals for coverage in Web of Science, ranging from the qualitative to the quantitative. We regularly review the journals to ensure they meet our stringent criteria and in the normal ebb and flow of our business, journals move in and out of the list. Forty journals were delisted from Clarivate’s Web of Science Core Collection last year — including Tumor Biology, after the journal had to retract 107 papers accepted using faked reviews. Yesterday, Clarivate posted an essay about its general decision-making regarding journal indexing. On its homepage, the journal lists its latest impact factor as the 2016 value, 5.168. We are hopeful that we can work with Clarivate to expeditiously reverse their decision and to continue indexing Oncotarget. I think it is a private company’s own decision which journal to include and wich not. Perhaps, the reason(s) can not be mentioned to avoid any potential trouble. It may, perhaps, seem troubling to be listed on Jeffrey Beall’s list of potentially (so-called) predatory journals. Given that the journal was on the Beall list, I suspect the reason for its removal are similar to Beall’s reasons for listing it. This, of course, then leads me (for one) to suspect that the reasons for its originally having been called a “rising star” might have been … less than sound. How was it possible to get a rather good impact factor for a young journal? WOS did’t show any warning period. Many students, especially in China, can not graduation from University. Due to the delist OT from SCIE which they might submission their articules several months ago. I wonder who will be responsible for the authors. The authors spend too many time and money to publish their works. But now their works are not recognized. I think in a free market any company can make its own decisions; but I hope for those students in China, or elsewhere, that their wise professors and universities will understand and address the problem and will certainly be able to allow the students to graduate. It may just take some time to carefully analyse and understand and solve the problem for the students. Best of luck to all. WOS should consider and respect the author’s interests. We hope that WOS can index of all online papers before 15th January, 2018 (official update time of master journal list). We also hope WOS give IF for 2017, as all papers in 2015-2017 are indexed by WOS, why not give IF for 2017? There are still many high citation papers before, this is injustice for not giving the IF for 2017. For author’srights and interests, WOS should index of all the accepted papers before 15th January, 2018 (official update time of master journal list). For all the the scientists, WOS should give the clear evidence and reason why oncotarget is not indexed. Unlike previous comments, I don’t think it’s unfair for researchers. Issues with oncotarget have been know and documented for the past 3 years. Lab heads continuingo to submit their work to pay to publish journals are either astonishingly out of touch with their field, or worst knowingly trying to easily inflate their productivity by by-passing stringent review process. As for PhD students, aren’t we supposed to teach them to be critical, they should also be aware of predatory journals. As mentioned some time ago on retraction watch, predatory publishing has become a symbiotic relationship rather than a simple predator/ prey interaction. completely agree. I have published to articles on Oncotarget a long time ago. During that process it became obvious that there were issue and the whole journal was more of a business model than anyhting else. I stayed clear from easy publishing ever since. Productivity cannot be equate to the number of manuscripts published in such journals. Many authors are the victims！ We hope that WOS can index of all online papers before 15th January, 2018 (official update time of master journal list). Author’s interests should be considered and respected . We really hope that WOS can index of all the papers that were online before 15th January, 2018 (official update time of master journal list). I do not think that Clarivate has any contract with authors, or countries. It is an independent company in a free world. So, anyone can calculate the number of citations or an impact factor. It should be up to the universities who educate their students to accept their contributions in science or not. This should not depend on any company. These are just different issues. WOS did’t show any warning period. Many students, especially in China, can not graduation from University. Due to the delist OT from SCIE which they might submission their articules several months ago. so WOS should index of all the accepted papers before 15th January, 2018 (official update time of master journal list). Website of science should consider and respect the author’s interests. We hope that Website of science can index of all online papers. Author’s interests should be considered and respected. We really hope that WOS can index of all the papers that were online (Advance Publications) before 15th January (official update time of master journal list), not only papers which have exactly page (volumesN1-N4) in 2018. All of the online papers which have published in public domain before the news announced should be index in WOS core list. Author’s interests should be considered and respected.We hope that WOS can index of all online papers (Advance Publications) before 15th January, 2018 (official update time of master journal list). The evaluation of scientific research in China is too dependent on SCI and IF. WOS kicked out oncotarget without warning.This has hurt too many Chinese authors.WOS should take action to remedy it. Author’s interests should be considered and respected. We really hope that WOS can index of all the papers that were online (Advance Publications) before 15th January (official update time of master journal list). Please stop copying the same text and posting under different names. This is called “spamming” and it certainly does not help your cause. Thank You – it is annoying to read too many emails with the same text. Why does anyone wants to punish the readers of retraction watch, the obviously wrong recipient. I think the decisions of a company are a companies’ decisiion – they may have come to the conclusion to do what they did. But I think for all those students suffering from that decision, they may ask their wise professors (and most likely co-authors) to support them. Perhaps, those universities may just check any of their contributions, if they are OK and fulfill normal academic standards and accept their students work who published and worked in good faith to do the right. All the best for those students. If their peer review is like the copy editing of this editorial (i.e. the poor grammar), I understand why they were delisted. One more thing. For your sake, I hope you have a good lawyer. If I were Jeffrey Beall you would be served with a libel lawsuit and cease and desist before the end of the week. It is absolutely unbelievable that anyone would think it was a good idea to hurl unsubstantiated attacks against an individual in an editorial for a scientific journal. e.g. “Beall chose Oncotarget as a main target for the attack.” Good luck defending against that statement in court! Or this one, “We were harassed on many levels, daily, including defamation in Wikipedia controlled by Beall’s co-fighters.” Incredible! It’s just further proof that the delistings were beyond warranted. Has it occurred to you that you might be digging your own holes? What does copy editing have to do with “foreign scientists”? Surely when charging $3400 per article you can afford to pay someone to copy edit a two-page editorial! Or maybe copy editors are conspiring against you also? Am I the only one that read Mikhail’s editorial and thought to themselves “if Trump was a scientist, this is precisely the kind of thing he would write”? Yes. I don’t see the similarities at all. Mikhail, I assume you are the writer of the editorial, I do have a slightly different opinion and I do find the editorial pretty delusional. Maybe one aspect is that part of the scientific community has lost confidence in Oncotarget, for all the agitation surrounding the journal in the past few years. I agree with many of your opinions, but the Editorial is “Oncotarget lesson”, which explains a wired fact that only publishers lacking subscription journals were put on Beall’s black list (exceptions are unknown to me). And most importantly, all journals (not half) of such publishers were blacklisted (why all?). Unfortunately a few librarians at key positions use this list without examination. Here, the scientific community should resist and demand a justification from Indexes. I hope that you agree with me. I agree with you that most librarians including Beall’s boss (as it was emphasized in the Editorial) do excellent job on their own, ignoring Beall’s recommendations. Librarians should work together with the scientists (and most of them do), and at least listen to their opinion. I couldn’t understand the sudden decision from Clarivate Analytics, because the Just three months ago, on October 18, Clarivate Analytics named Oncotarget a “rising star” in the field of molecular biology and genetics. Why? Please Clarivate Analytics give specific reason. I hope that the Clarivate Analytics can consider the authors’ benefit. Please index all the online papers before formal announcement (Jan 16,2018). Thank you very much! WOS made a wrong and impulsive decision. They deserved a positive response. Avoidance is not always the way. We won’t let it go. Wos should be updated regularly for a year or two year, since it would take at least half a year for an article to be submitted to the publication, which would be unfair to the author. WOS should have a minimum of 3 months’ transition time and buffer time before removing a magazine from his list, giving authors more time to get the information and to decide whether to submit their studies to these journals (e.g., Oncotarget, Tumor biology). Since many people use WOS’s magazine as a benchmark, WOS should show a more responsible attitude. In addition, I think since the papers published in Oncotarget in 2017 have been fully indexed in the WOS, the impact factor of the magazine in 2017 should still be calculated. It is also a responsible attitude towards authors and readers of the WOS. Since the IF is calculated based on the citation of the former year, and oncotarget is still indexed in the whole year of 2017，the IF should be given in 2017. I don’t think it is fair for the Web of Science to make these reckless and irresponsible decisions, without providing evidence or a rationale to support their conclusion. What’s the really academic freedom? i suppose it is to give a platform to all the researchers to share and communicate their results equally. Delisting the journal from web of science is not a good news without sufficient notice. At least, articles before June 2018 should be collected in the wos. There is something unconvincing about these streams of near-identical messages about Clarivate’s impact-factor obligations, in quick succession, but all with different names. This is typical of what has happened elsewhere on pages that involve Impact Journals, Oncotarget, Aging, or Blagosklonny himself. Wikipedia administrators recently had to ban several anonymous IPs and clearly fake accounts that were editing pages related to these topics in attempts to remove any negative information. It’s not too difficult to see what is going on here. It seems really unfair to the authors who submitted their papers several months ago and published online before Jan 17. WOS should follow the rules that are inherited from Thomson Reuters. is there anybody contact or question the WOS? Many authors contact WOS via email. But there is no respond. Problem: People not receiving academic credits for papers in Oncotarget, because their universities only recognise Clarivate-indexed journals and publications. Remedy #1: Lobby those universities to change their policy. Remedy #2: Lobby Clarivate to change its coverage and index Oncotarget. Remedy #3: Lobby the Oncotarget editors and publishers to make whatever changes are necessary to satisfy Clarivate. … Lobbying RetractionWatch is not a remedy. Perhaps, universities which gave academic credits for papers in that journal may check if their students and authors did anything wrong. So far, it is not clear why a private company like clarivate would have made that decision for no reason. They can do what they want, but one may consider they did the right thing. Before argueing about the possible reasons why Oncotarget was removed from indexing, scientists should perhaps be critical and ask themselves what they did to support the sympiotic relationship nick was correctly writing about. I published papers in Oncotarget myself, but I am strongly convinced that during the last years there was a steady decline in the editorial strictness concerning the quality of manuscripts and reviews. I also reviewed for OT, but one paper was accepted although I clearly stated that it should be rejected. A lot of my colleagues also submitted to OT, however, no paper was ever rejected. In summary, from my perspective there are enough issues with the scientific quality of the journal that justifies its (future) removal. I never published or reviewed any manuscript with or for that journal (or most others), but recently had to reject a wonderful manuscript for another journal, just because there were too many smaller mistakes or errors. So, from that point of view it may be frustrating for all, the reviewers, editors and authors. So one can only hope the authors won’t be too frustrated and make the suggested (number) of corrections and make the journal good. I’ve seen that there are big names on the editorial board of Oncotarget – so, I wonder how they feel that their names have been used in case there was something going wrong which may justify removal from the indexing. I had exaclty the same experience. Some of the emails from the editorial board (M.B) were absurd and sort of surreal. They might have been reputable, they built up their IF, they convinced people like me to publish in there, they realized it was very very profitable and probably just went for numbers rather than quality (or this was the strategy from the very getgo). In response to BigB: It is not correct to make defamatory statements. Messages about Clarivate’s impact-factor obligations are not coming from us or organized by us. Wikipedia pages should contain a factual and neutral information and not reflect the opinion of one person (for example, Jeffrey Beall)/ or group of people with the same agenda. We are fine to have a critical information on our pages, but we are not fine with using Wikipedia as a platform for allegations to promote one agenda. We would appreciate to have a discussion in a proper manner. Previous Previous post: Is our database missing a retraction? Tell us!